However, my secret penchant hasn’t been all so secret lately and I have been grabbing up every opportunity to treat my senses. So when my sister’s Mother-in-law visited recently from India, I knew she’d make some seriously delicious spicy stuff, owing to her expertise in Maharashtrian cooking. Maharashtrian cooking is inherently blessed with lots of piquant and pungent flavors, owing to the high usage of chilies, whole and ground spices, peanuts, coconuts and tamarind. To me, the Maharashtrian cuisine comes a close second to Bohra cooking, which is the cuisine I grew up eating. During one early spring, cold Minnesota evening, when all we could feel were remnants of the horrible winter, but clearly sense the warmth of the summer, we all craved something spicy, something tangy, something to go with steaming cups of masala chai. 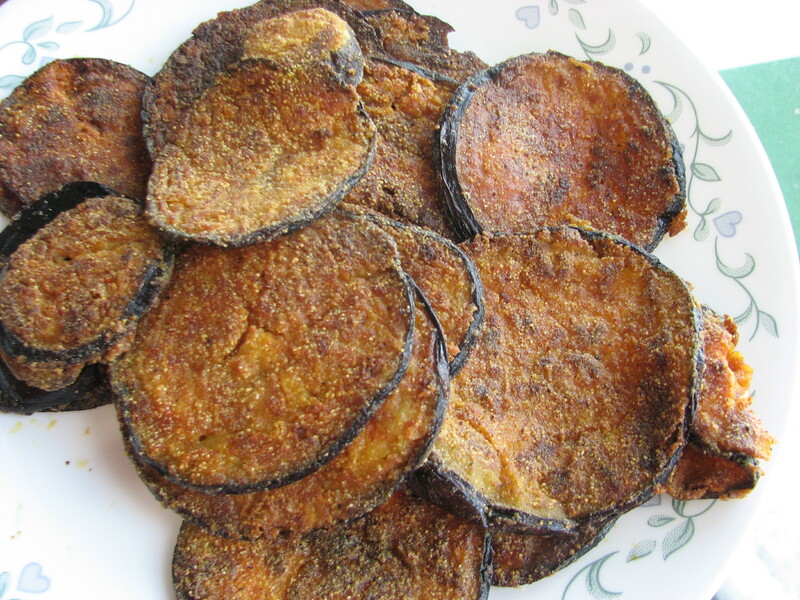 And the result was these yummy Eggplant Crisps. Watching aunty make the appetizer was a lesson in simple, uncomplicated cooking. 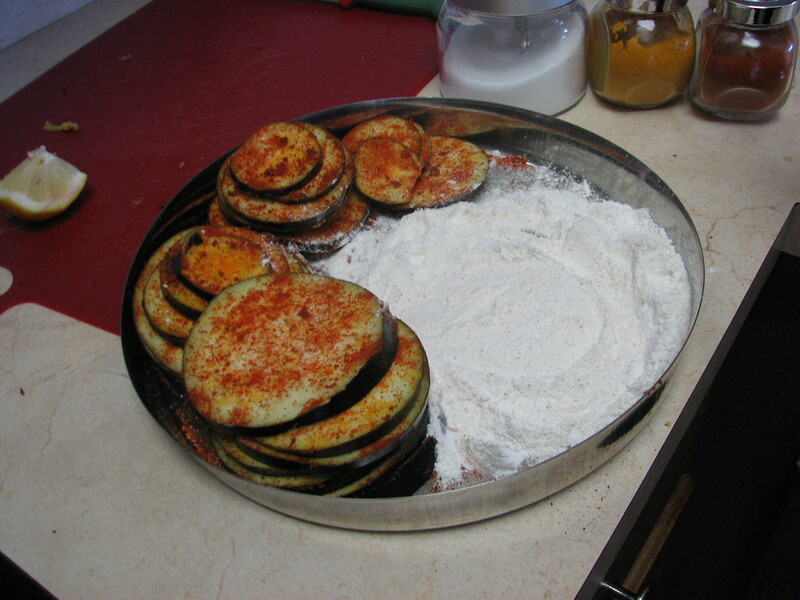 She first thinly sliced a large eggplant and laid each slice out flat on a plate. Then, she did a spice rub on both sides of each slice, covered them in rice flour, and patiently toasted them in a little oil until they were crisp and golden brown. The kitchen smelled divine. I expected a monotone of spice. But the taste was surprising and a pleasant shock to the mouth. Once I got over the crisp texture, the explosion of spices went really well with a sip of hot chai. And not to mention, it was incredibly warming. It was hard to believe something so delicious, so delightfully spicy, was so easy to prepare. I have modified the recipe to keep this dish’s flavors intact, but reduced the amount of spice to make it a little more palatable for the humid summer months. Try it the next time you make simple lentils and steamed rice and you’ll make a special meal out of it. Seems likea super easy dish to make.WOnder if I could think of it as a starter for my guests? That would be a great idea Anita. Make sure to serve them fresh off the frying pan. The crisps are so yummy you don’t really need a dip to go with it but you could serve them with something yogurt-y if you like. I thoroughly enjoy spicy food and this is totally my kinda snack. I am glad that I stopped by your space today. Looking forward to connect and learn more. Thanks for stopping by my blog, Radhika. Glad you liked the recipe! I love eggplant and this recipe just makes my mouth water! I want to ask you though, is the texture of these eggplants supposed to be as crisp as potato wafers? Because I tried it out a few days ago and they were not that crisp even though they had browned sufficiently. They were still delicious though! So I just thought of asking you if they are supposed to be very crisp, because then I think I need to cut them finer or maybe keep them on lower heat for more time. Hi Shraddha – Thank you for trying this recipe! 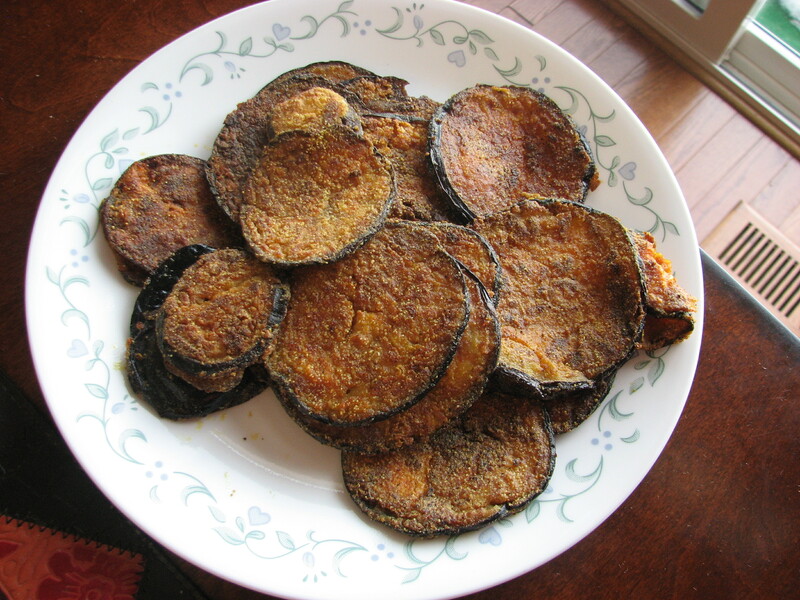 The eggplant is not supposed to be as crispy as wafers, but it should have a little bit of a crispy texture once toasted. Keeping on lower heat for a longer time will certainly help but the crispness should be like fritters or bhajjis. Aah, I see! Lowering the heat and toasting them for just a little more time will get me there I think. Thank you! I am planning to make this recipe for some of my guests. But like you mentioned, it should be hot. I started looking at your Prawn curry recipe and i wanted two veggie Sides and i think this will make a good Veggie side. However, I was hopping i could prepare everything and just place it in the oven for cooking, and then when it’s dinner time, i can pop it out of the oven and serve. Do you have any suggestions how it would work if i made it in the oven and at what temperature and for how long?